On the Start screen, in the Search box, type Hyper-V. Tap or click the Turn Windows Features On or Off link. The Windows Features dialog box appears. 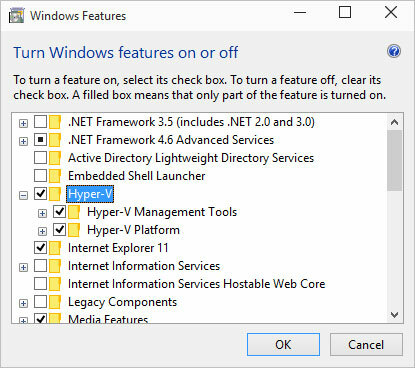 Select the Hyper-V box and the two boxes below it, and then tap or click OK. Windows installs two programs: Hyper-V Manager and Hyper-V Virtual Machine Connection. Reboot after the installation finishes. When Windows comes back, tap or click the Start icon, Windows Administrative Tools, and then Hyper-V Manager. 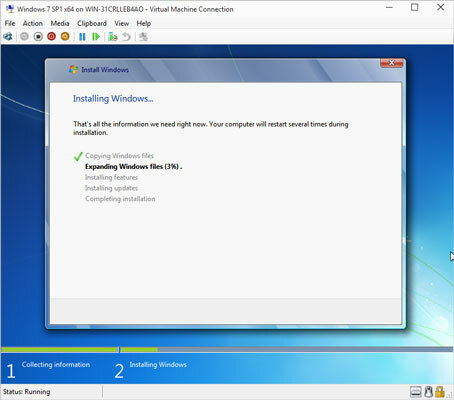 Hyper-V brings up the rather intimidating screen shown. On the right, tap or click Connect to Server. Choose the Local Computer button, and click OK.
Hyper-V brings up the even-more-intimidating dialog box shown. On the right, tap or click Virtual Switch Manager. The Virtual Switch Manager for your PC appears, as shown. Assuming you want your new VM to be able to communicate with the outside world — for an Internet connection, if nothing else —it’s easiest to set up that connection before you create the VM. The connection is done through a virtual switch, which ties a connection inside the virtual machine to a physical device on the outside, in the real world. In the drop-down list, choose External. On the right, click Create Virtual Switch. You’re asked to set up properties for the new virtual switch, as shown. At the top, give the new virtual switch a name, and tap or click OK. Chances are good that you want your VM to connect to a physical network adapter in the outside world, so leave the default selections the way they are. Hyper-V goes back to the Hyper-V Manager dialog box. On the right, choose New, Virtual Machine. Tap or click Next. 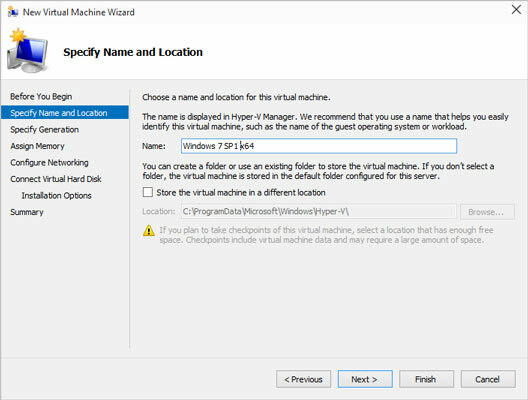 Let the New Virtual Machine Wizard walk you through set up. You’re asked to specify a name and location for the VM, as shown. Type a name that will immediately tell you what you’re running on this VM; if you need to move the location of the VM (remember the VM is a program, and it needs to store its files somewhere), change the location. Tap or click Next. Choose Generation 1, and then click Next again. VMs take up lots of room, and each time you take a snapshot, you store away the entire status of the VM — including any data on the disks, copies of installed programs, and all settings. The wizard asks how much memory you want to assign for startup. If you’re going to run Windows 7, 8.1, or 10 and have at least 4GB of memory, set startup memory at 2048MB and select the Use Dynamic Memory for This Virtual Machine box. If you have many programs running, the memory constraints can slow things to a crawl. Linux fans can get by with 512MB and no Dynamic Memory. Tap or click Next. You want enough memory so the VM doesn’t start thrashing, but you don’t want to specify too much in case you try to start many VMs at the same time. 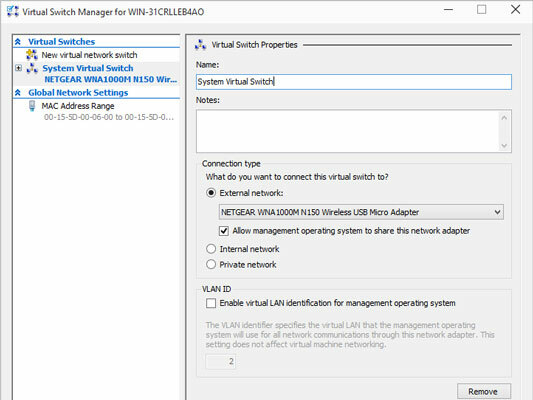 Hyper-V wants to know whether you want to connect the VM to a network adapter. You set up the virtual connection already, so it’s easy. In the Connection box, choose the name of the connection that you created. Tap or click Next. Hyper-V wants you to set up the virtual hard disk. In case you’re wondering, the virtual hard disks inside Hyper-V are quite different from the disk virtualization done in Windows Storage Spaces. Don’t be confused. They work in completely different worlds. Type a new name if you like, and tap or click Next. The defaults here are fine. 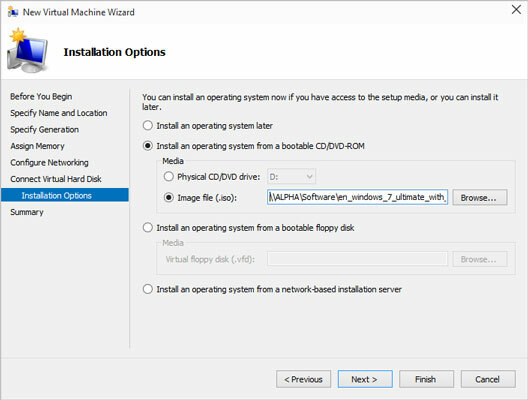 You see the final key step in the wizard, which asks you how you want to install the operating system on the VM. If you have a Windows installation disk or file, select Install an Operating System from a Boot CD/DVD-ROM and tell Hyper-V where to find the Boot CD/DVD (or ISO file, if you have one). Tap or click Next. Hyper-V gives you a last look at your settings. Your new VM appears in the list of virtual machines shown on the main window. To start the VM, tap or double-click it and, if necessary, choose Action, Start. You see something like the VM here, which runs Windows 7 in a VM inside Windows 10. The first thing you want to do with your new VM is add an Integration Services Setup Disk, so you can control the VM more readily. To do so, choose Action, Insert Integration Services Setup Disk. That just barely scratches the surface of Hyper-V. For more info, start at Microsoft’s Hyper-V support center.